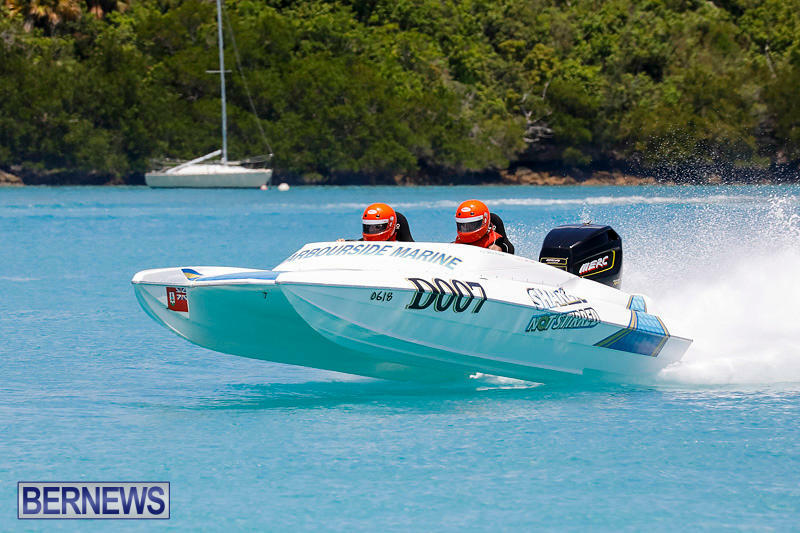 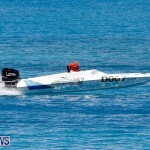 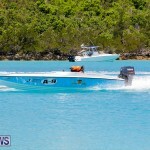 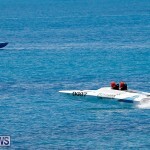 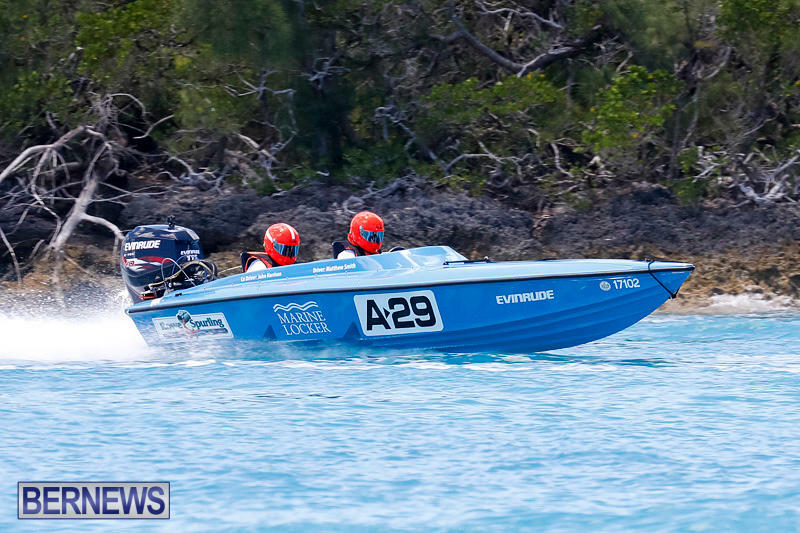 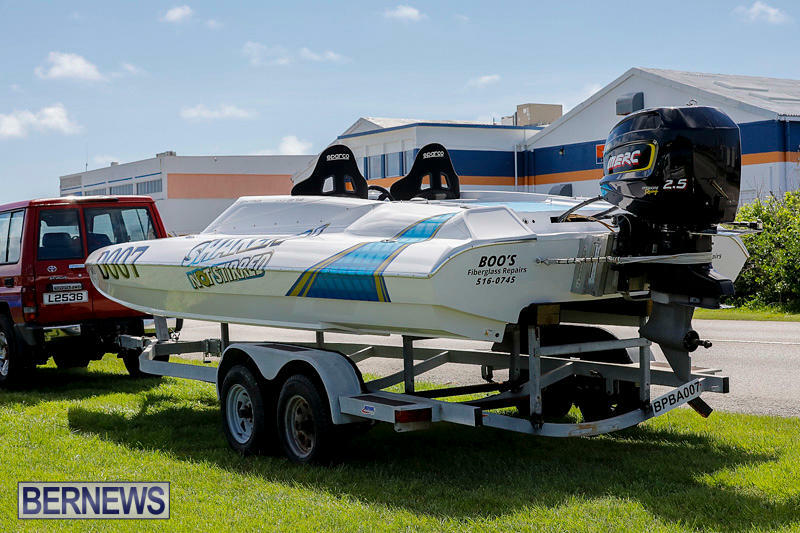 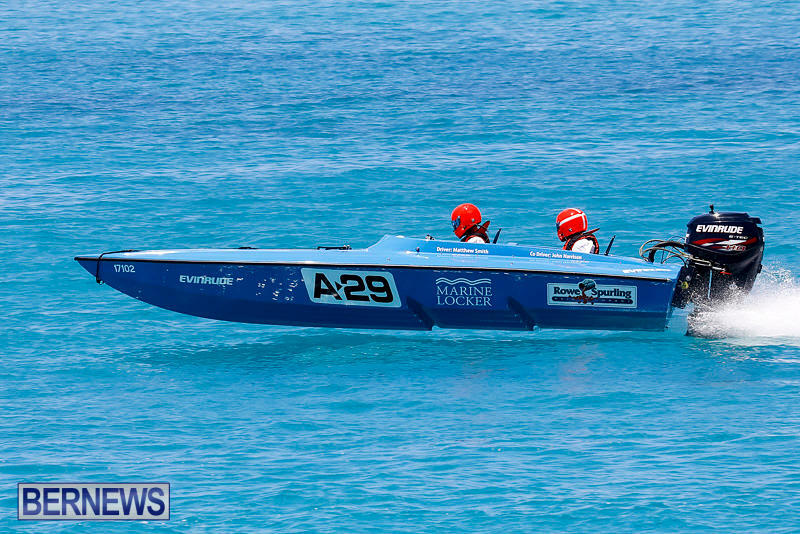 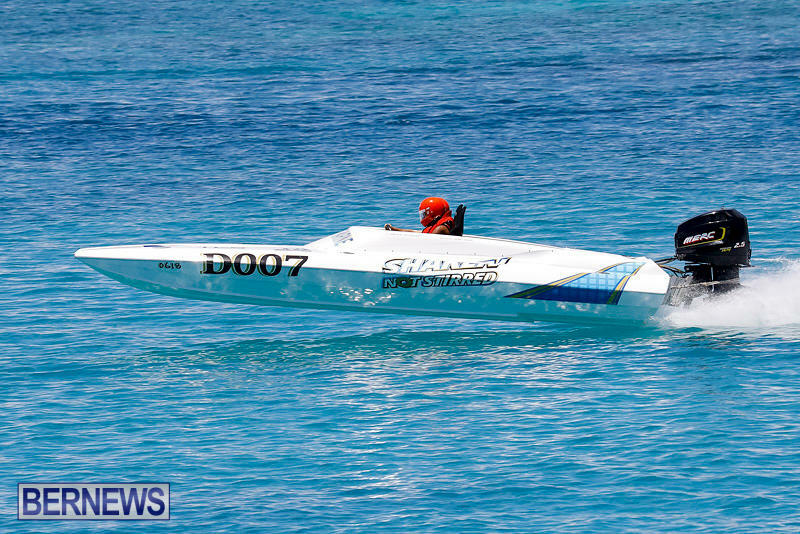 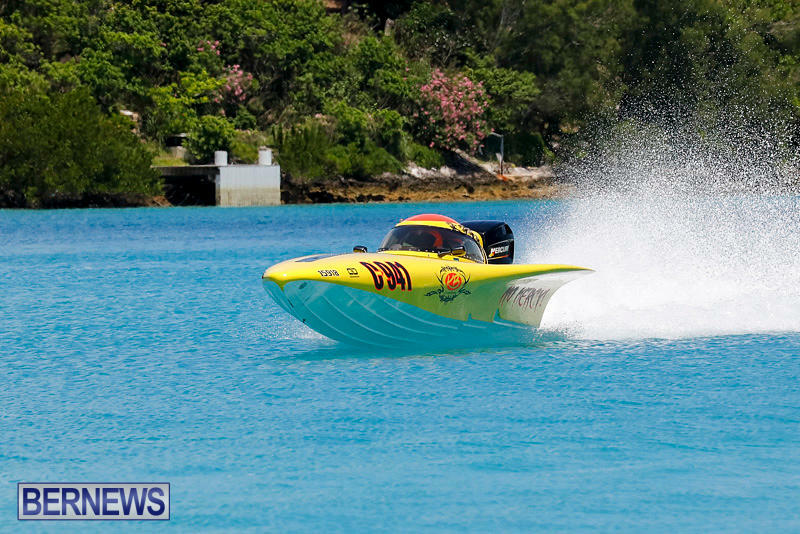 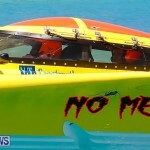 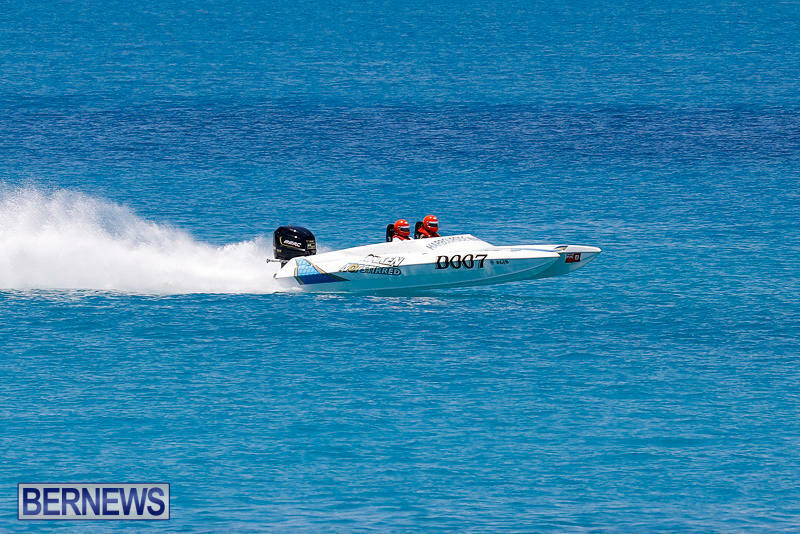 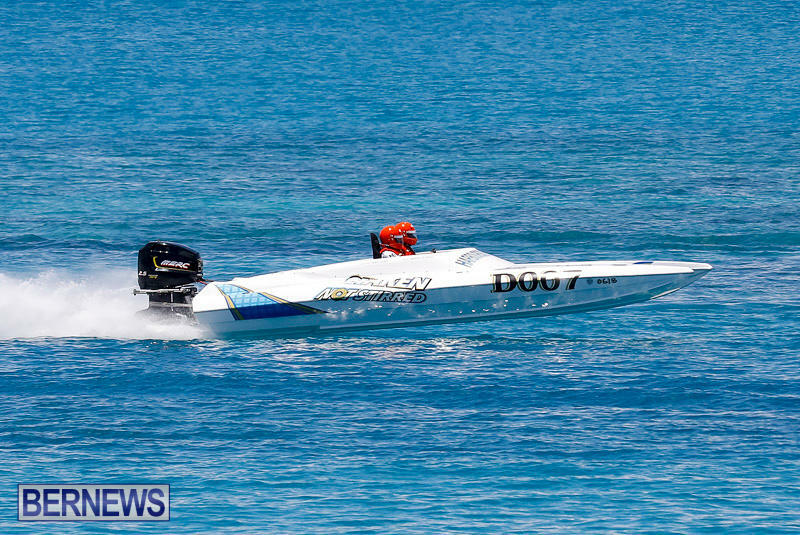 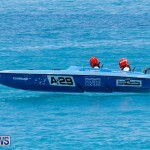 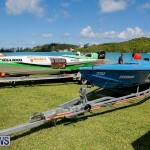 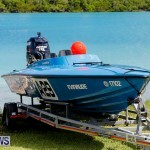 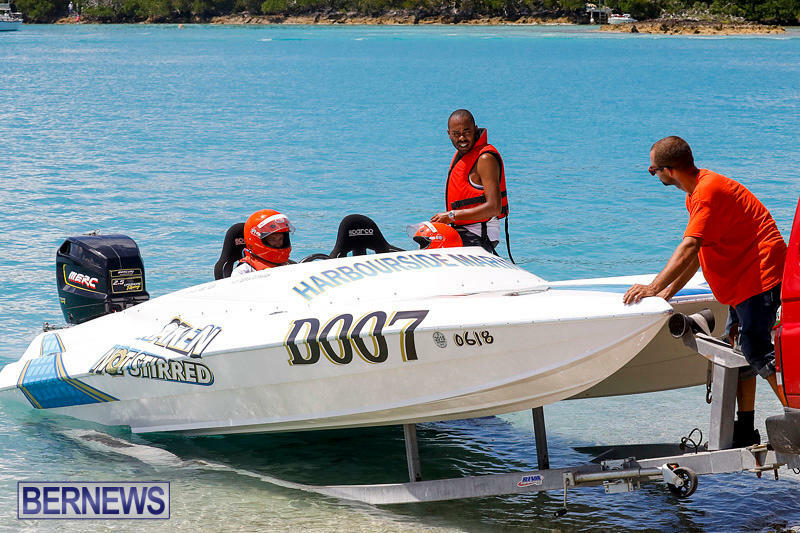 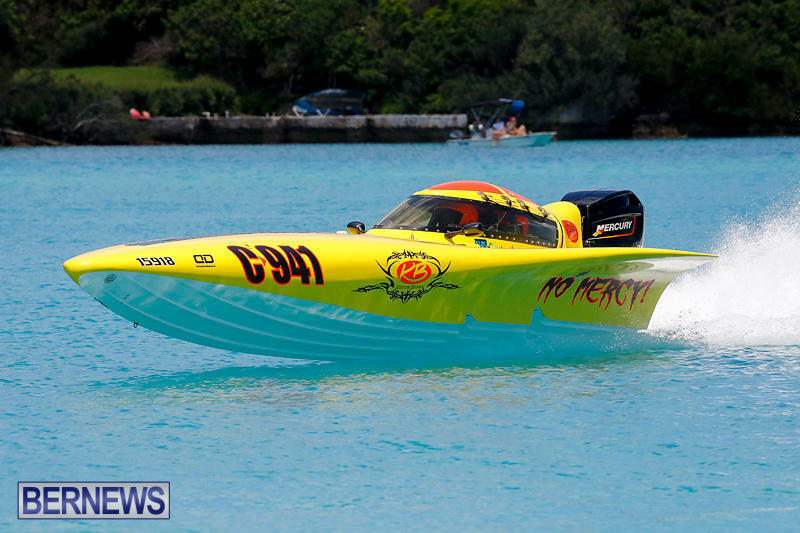 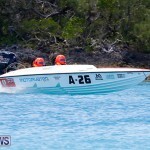 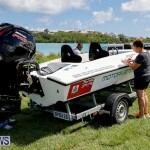 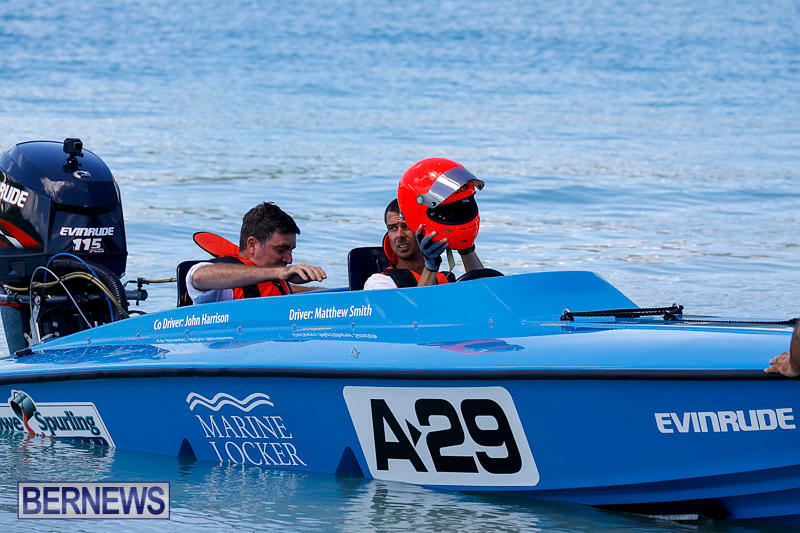 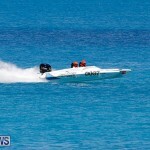 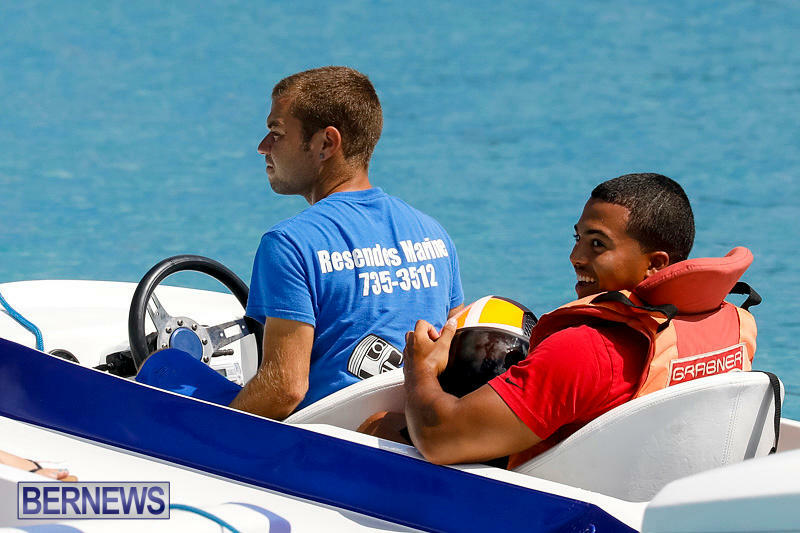 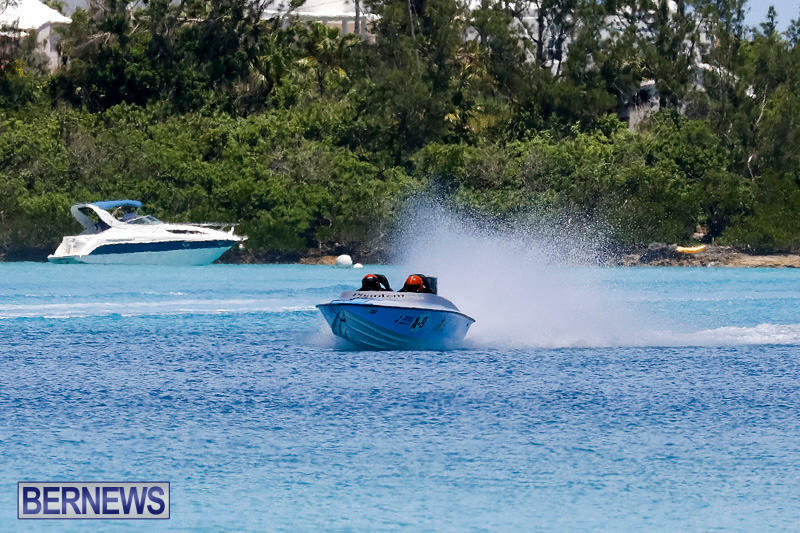 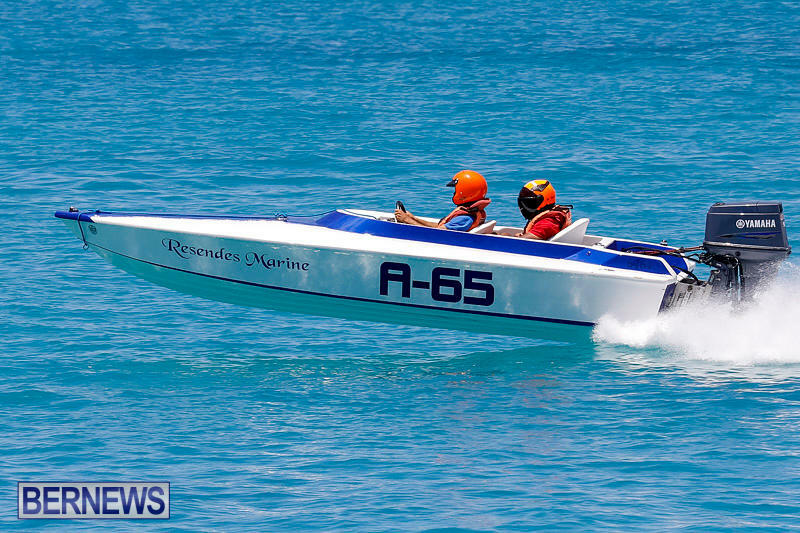 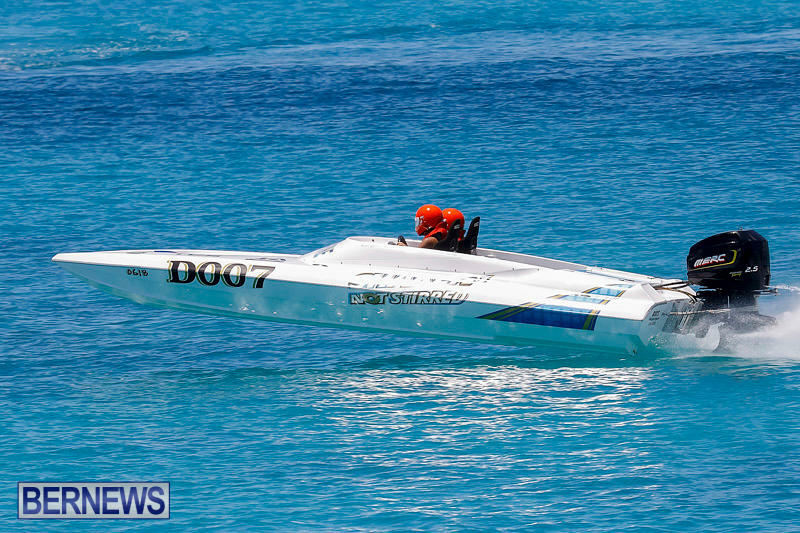 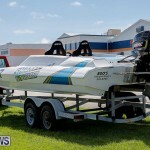 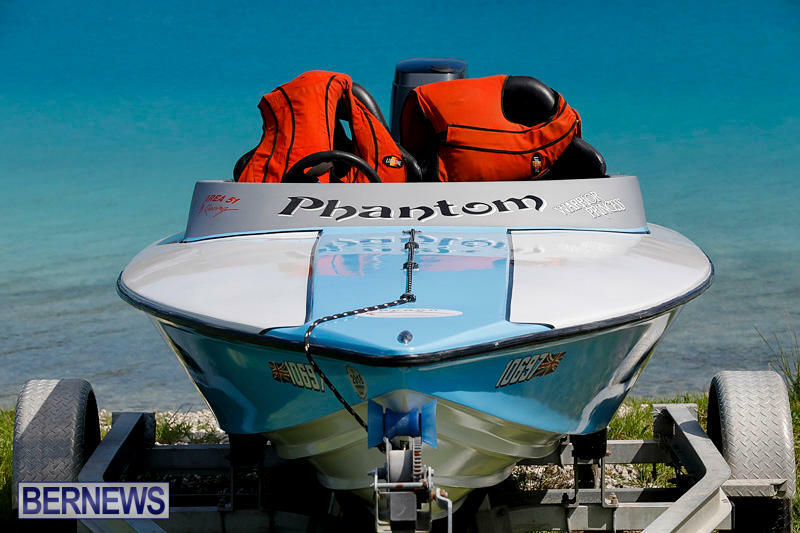 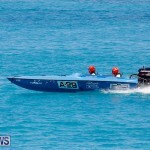 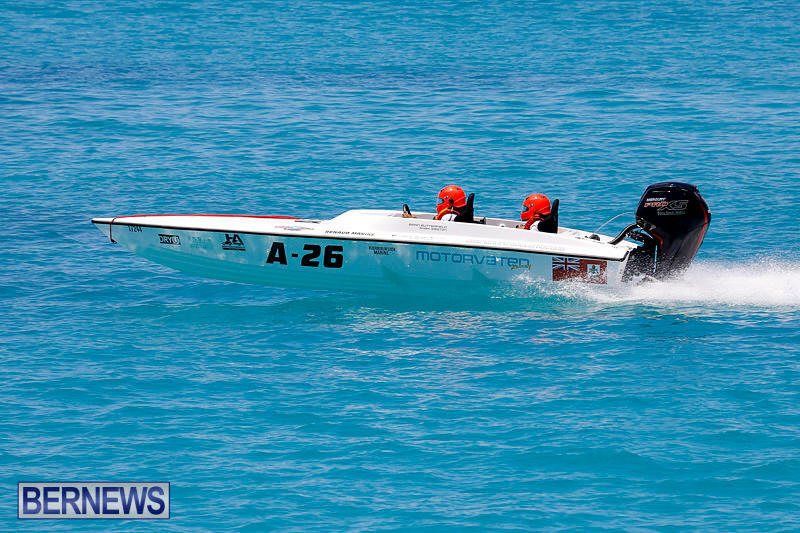 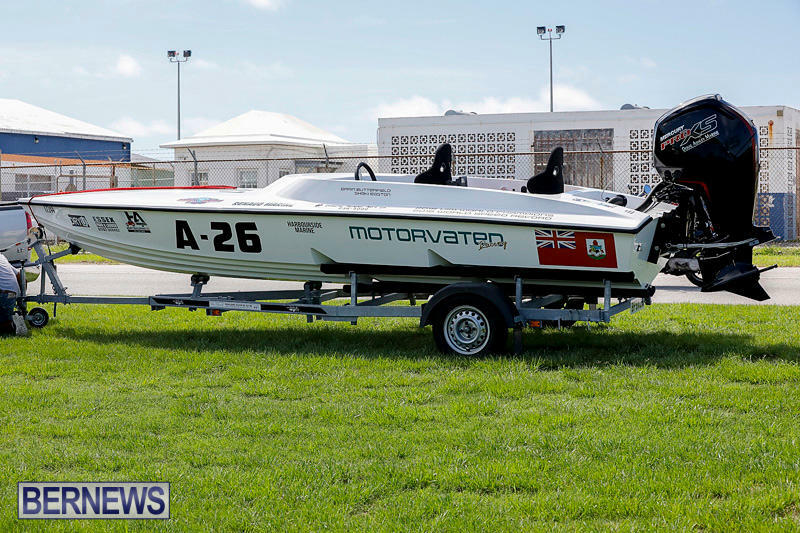 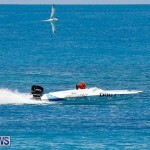 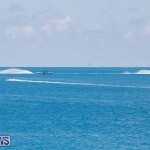 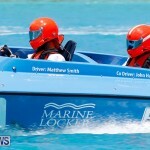 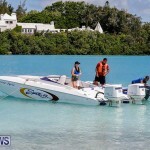 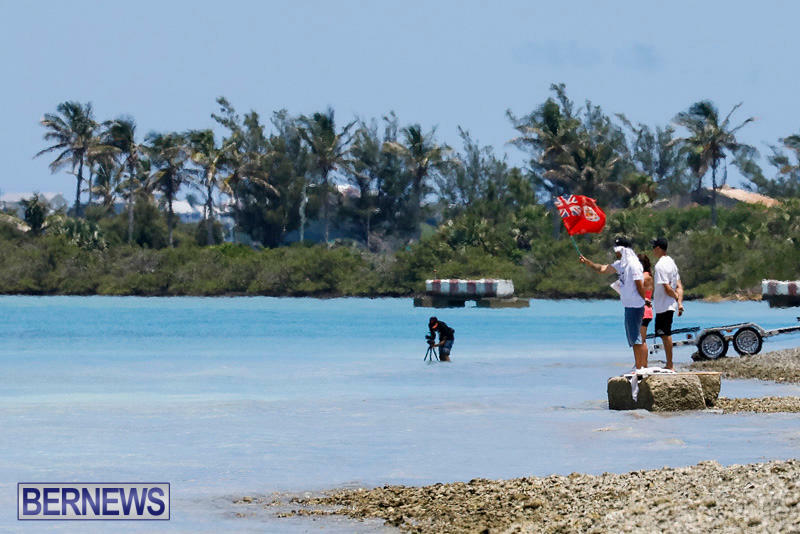 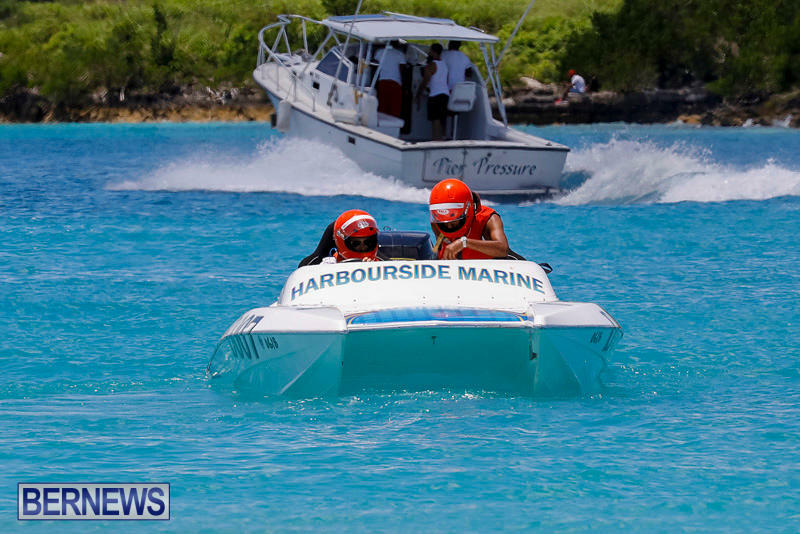 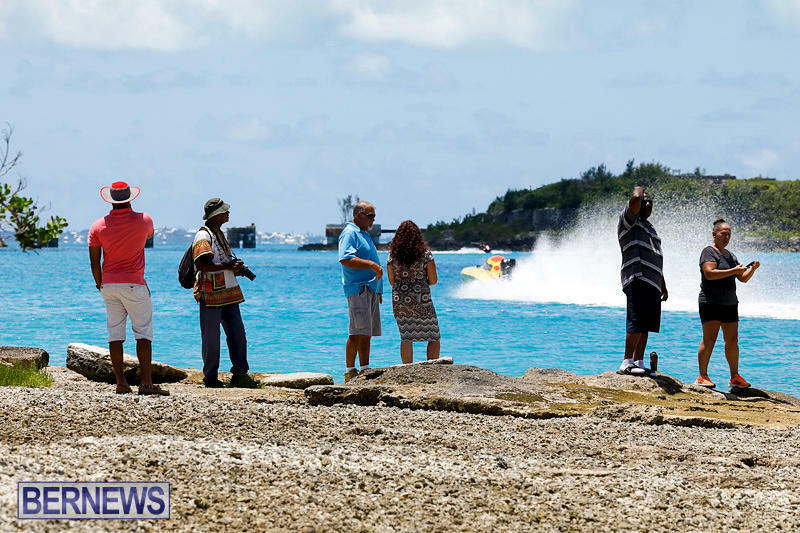 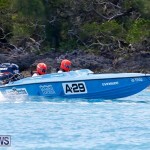 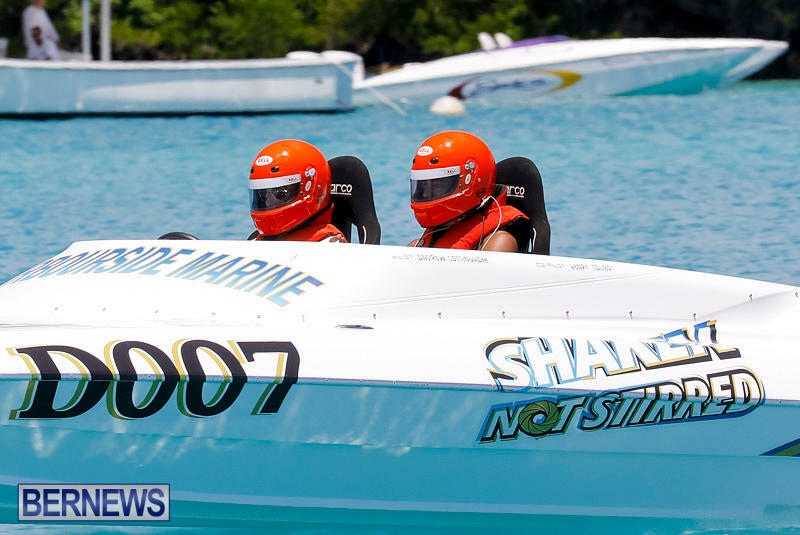 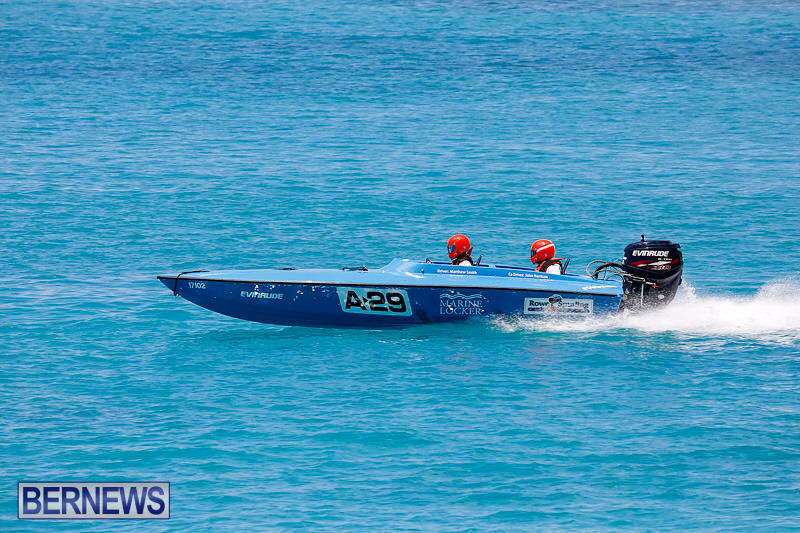 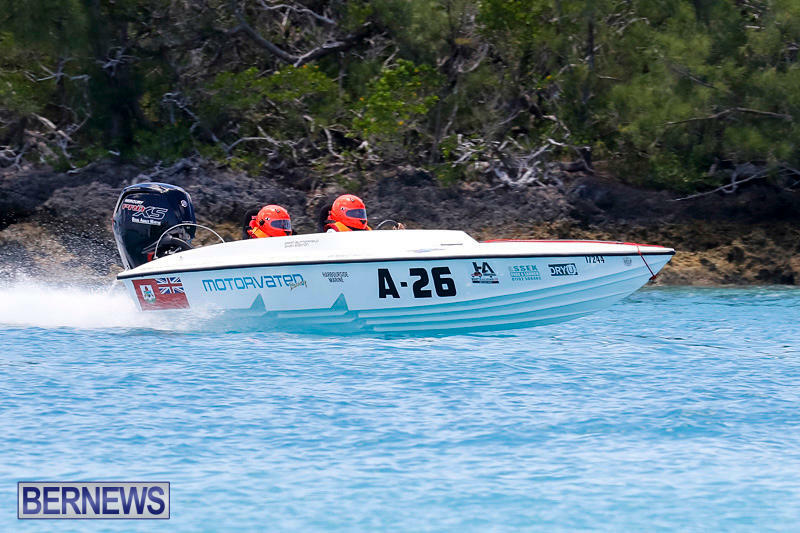 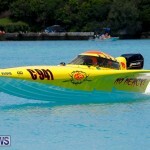 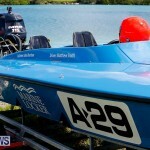 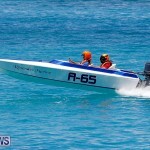 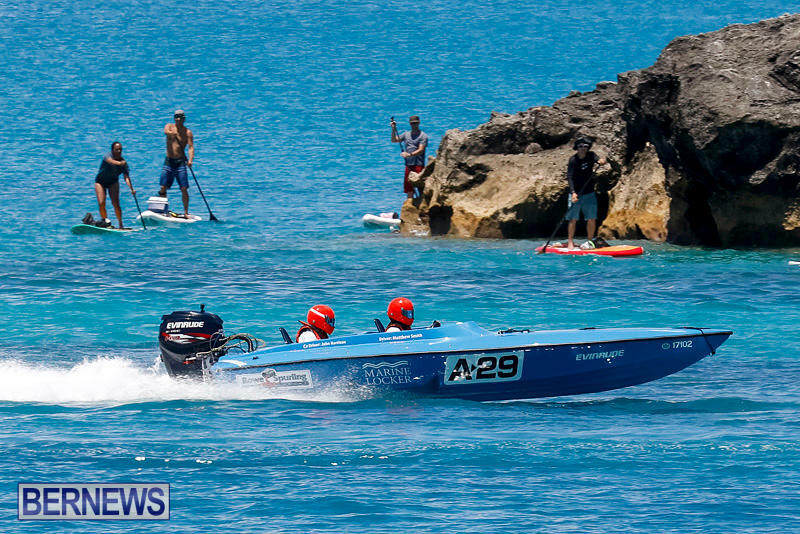 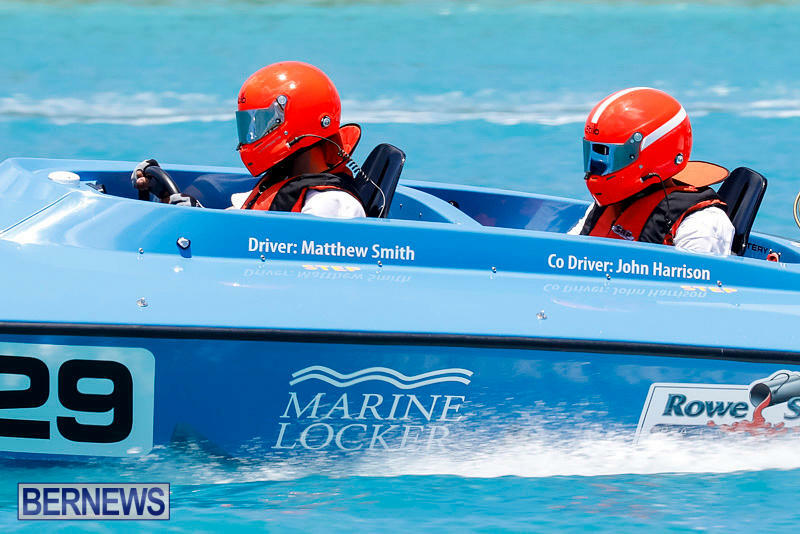 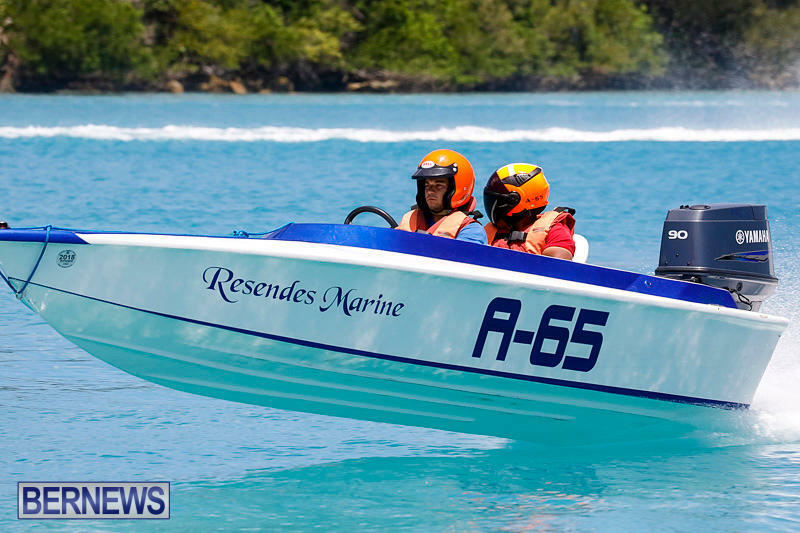 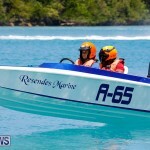 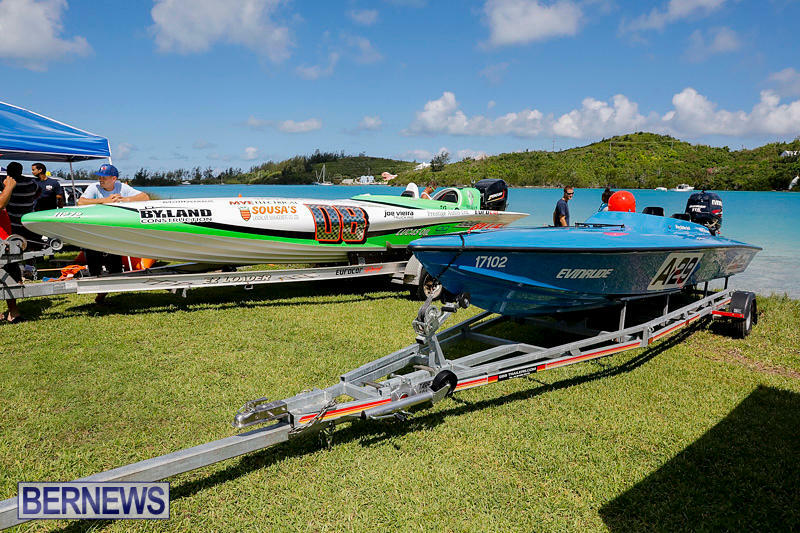 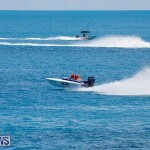 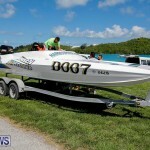 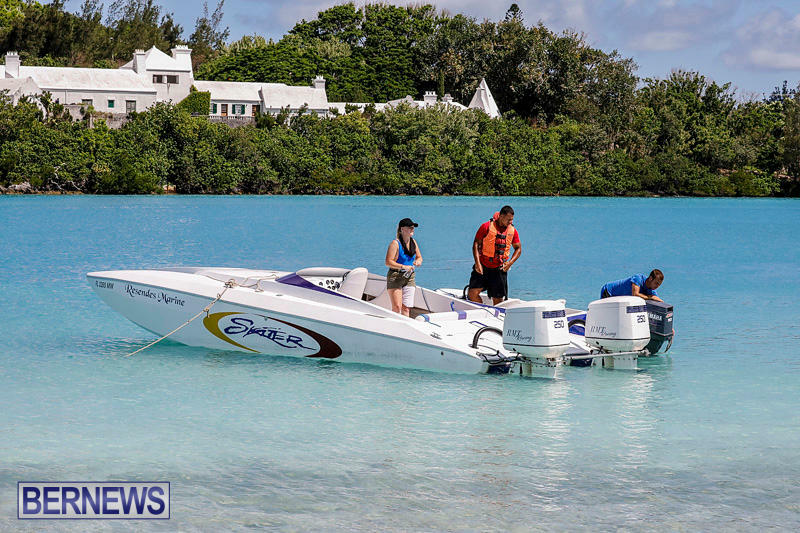 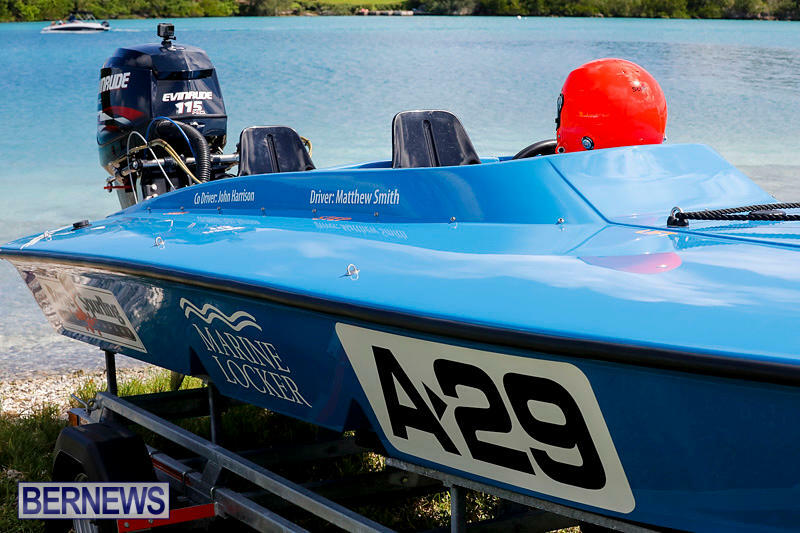 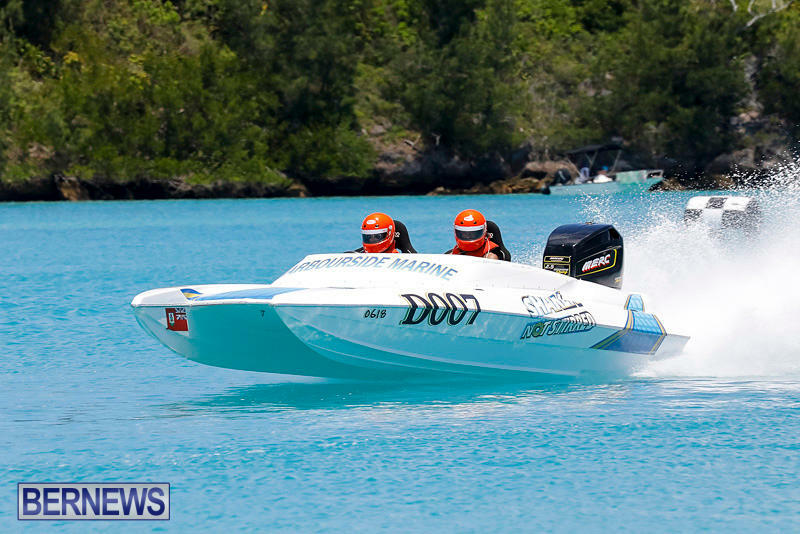 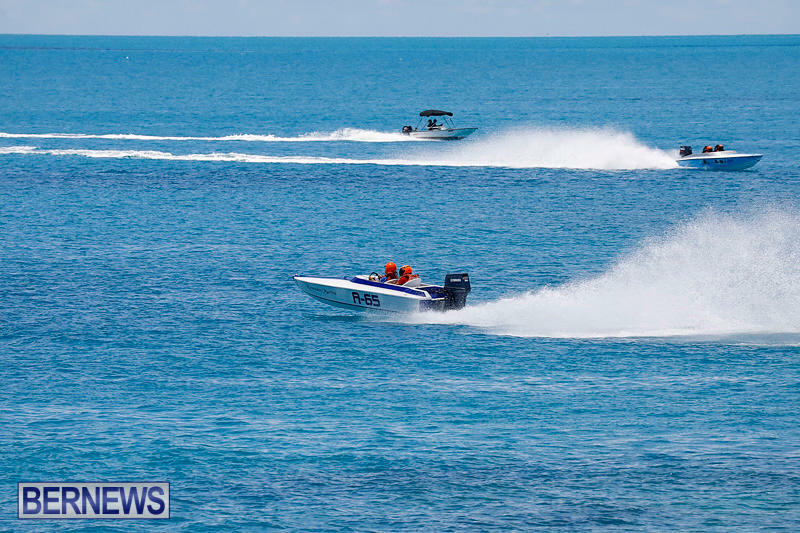 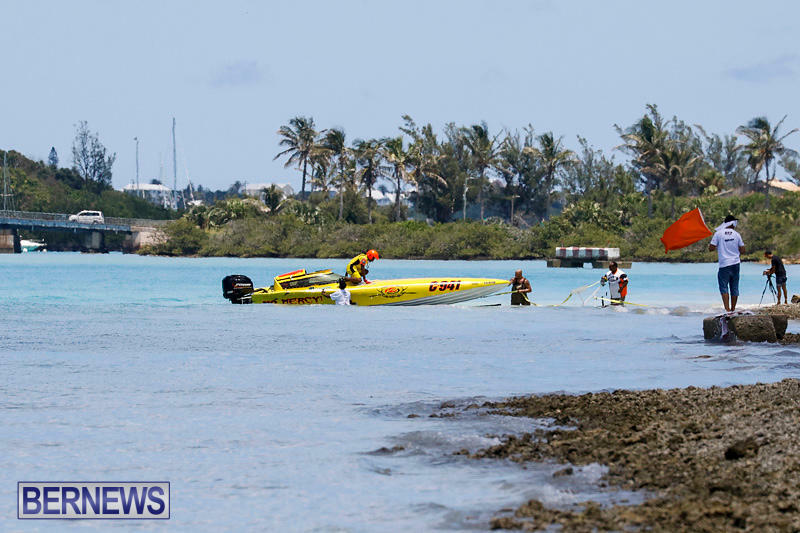 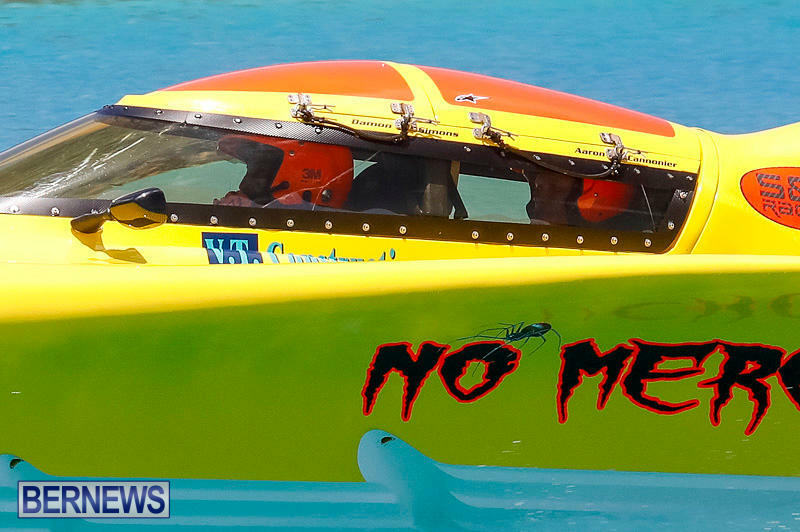 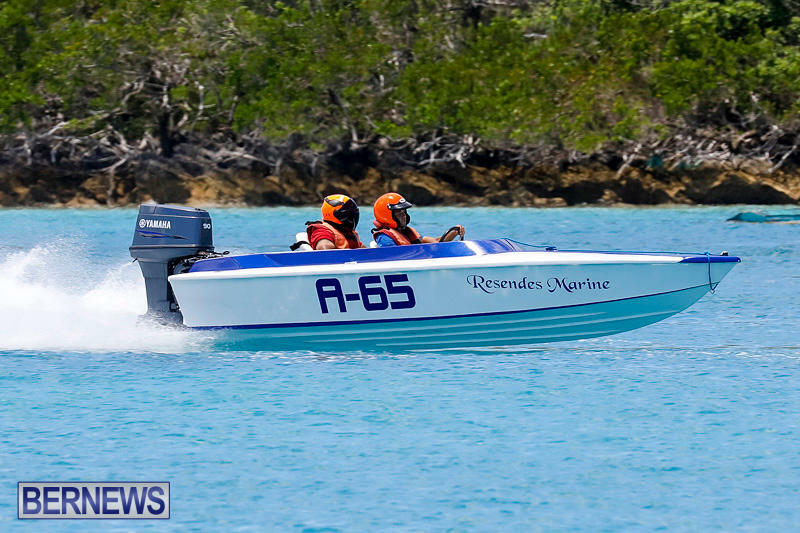 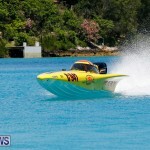 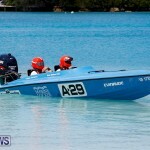 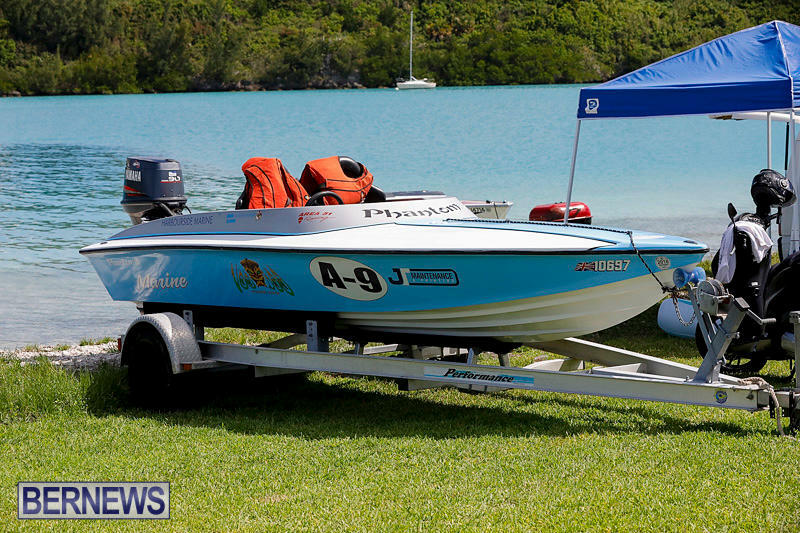 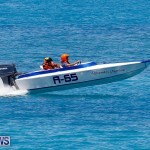 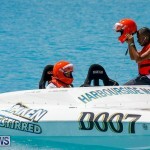 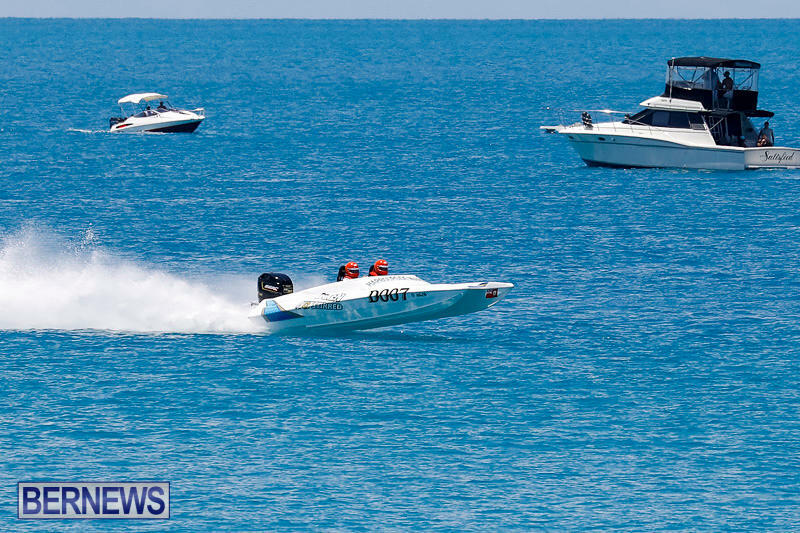 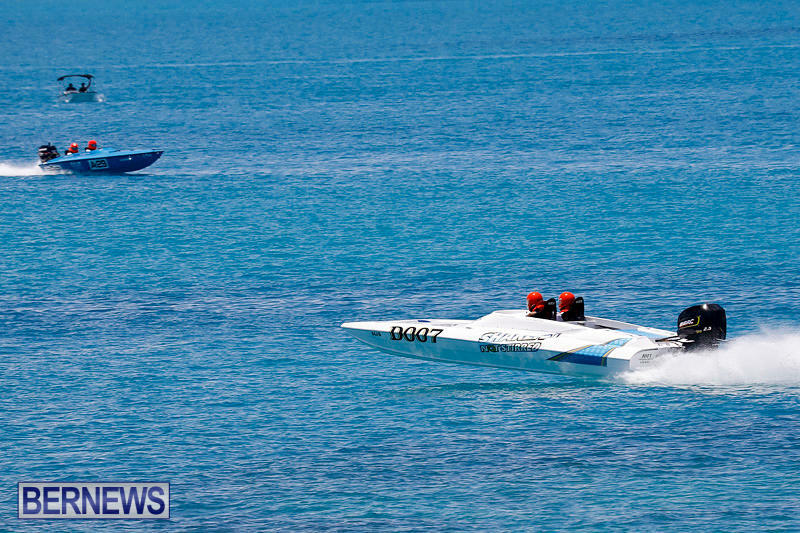 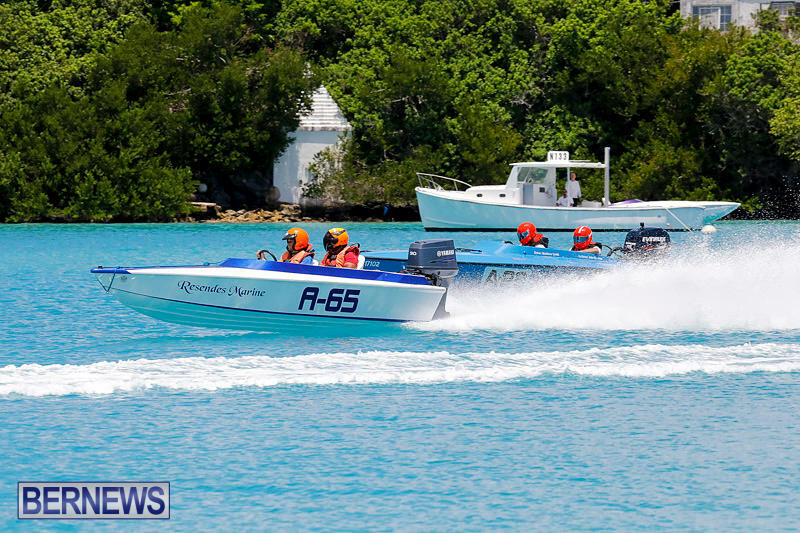 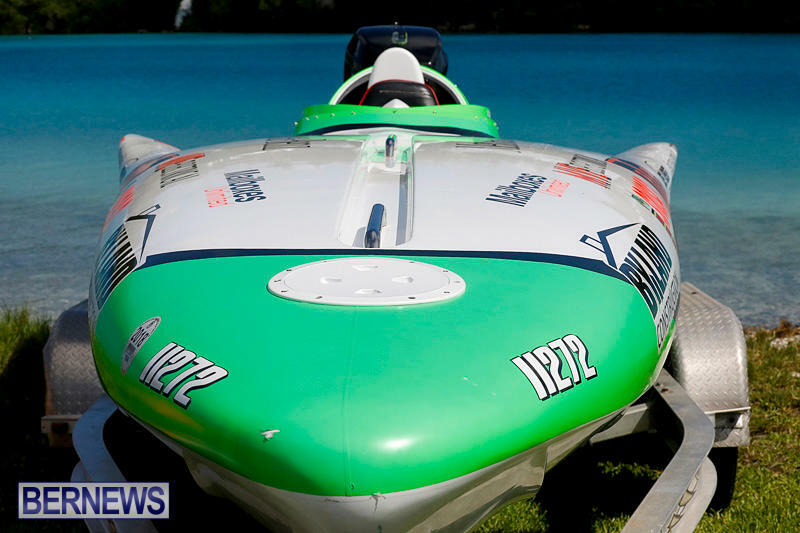 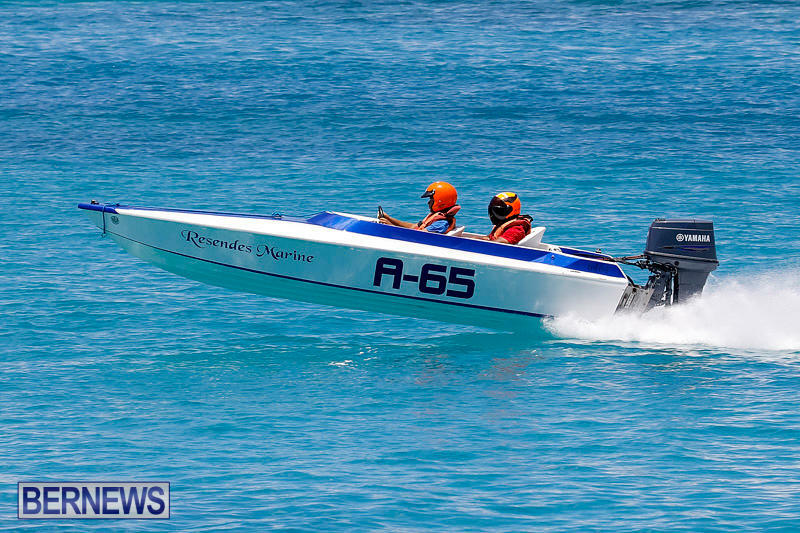 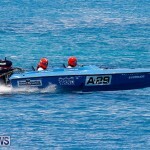 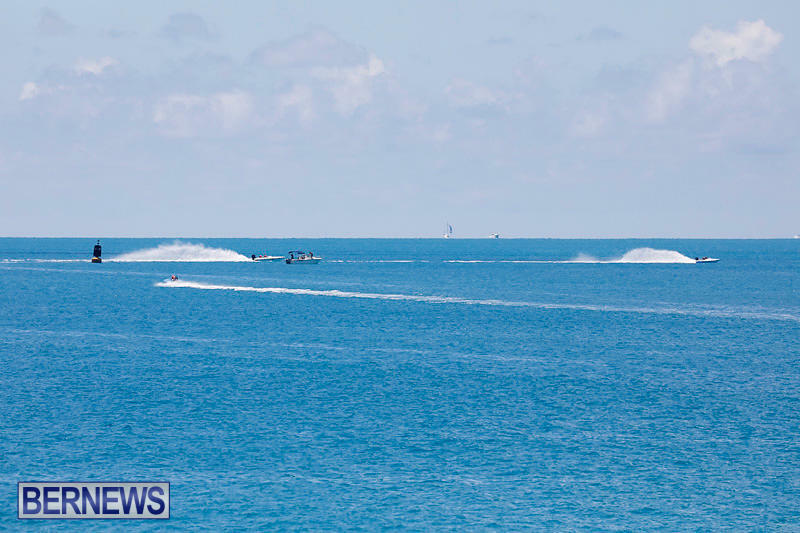 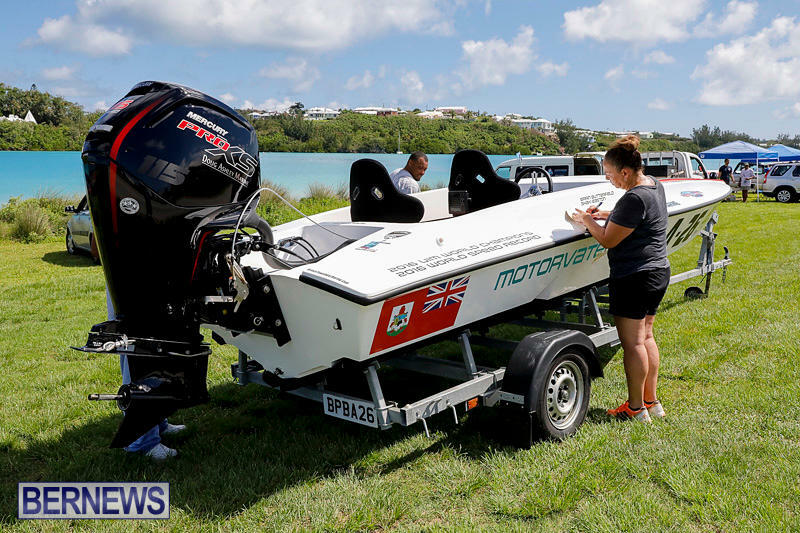 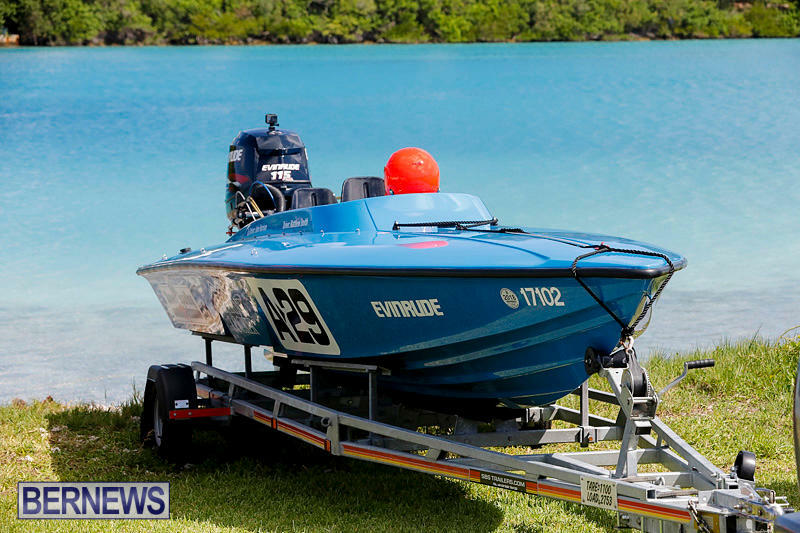 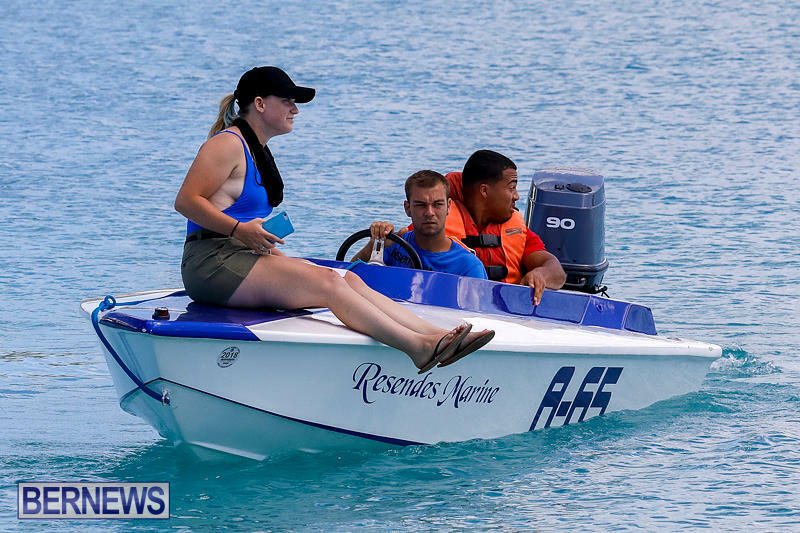 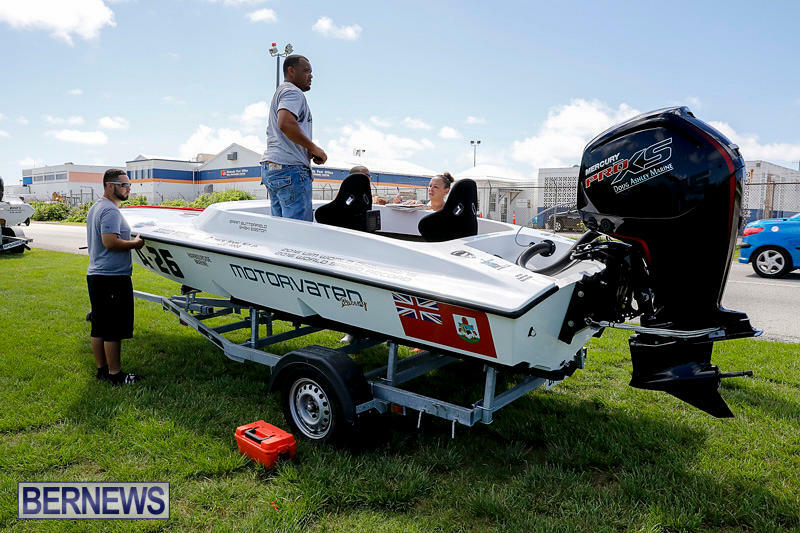 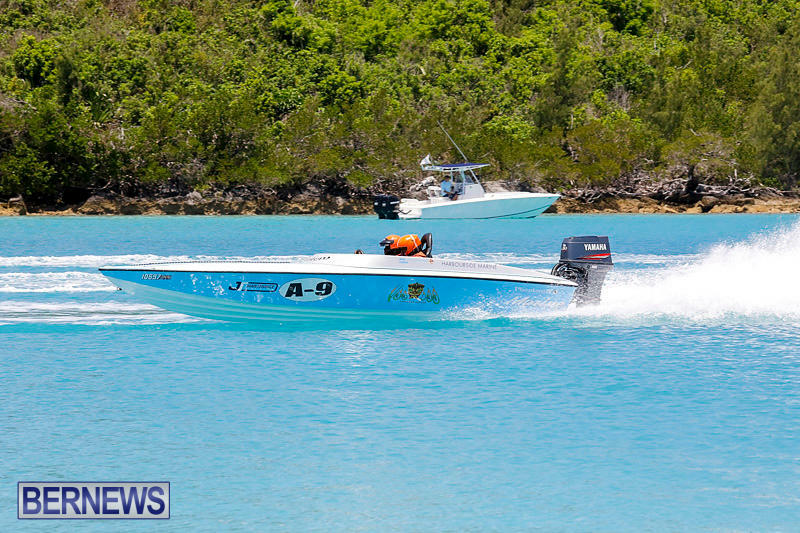 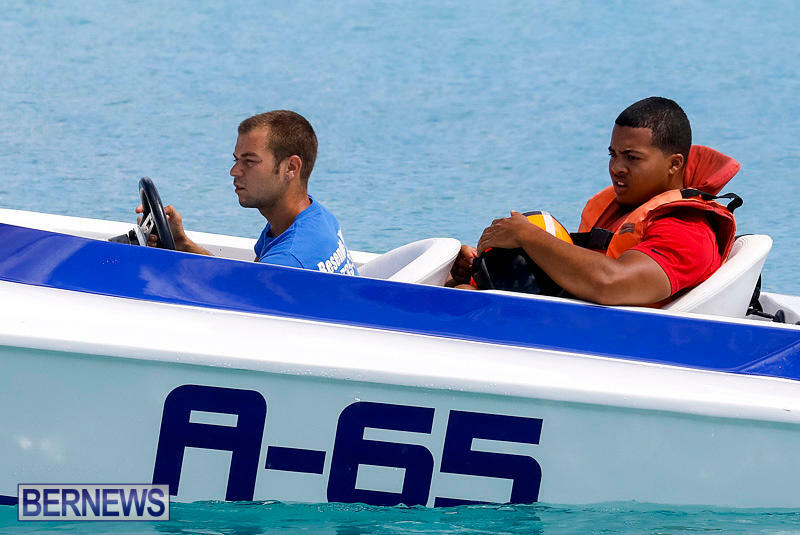 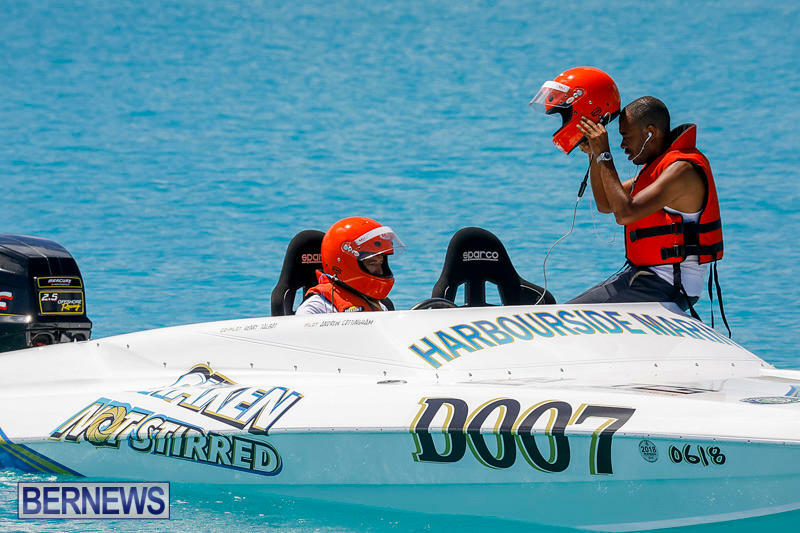 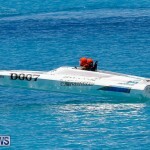 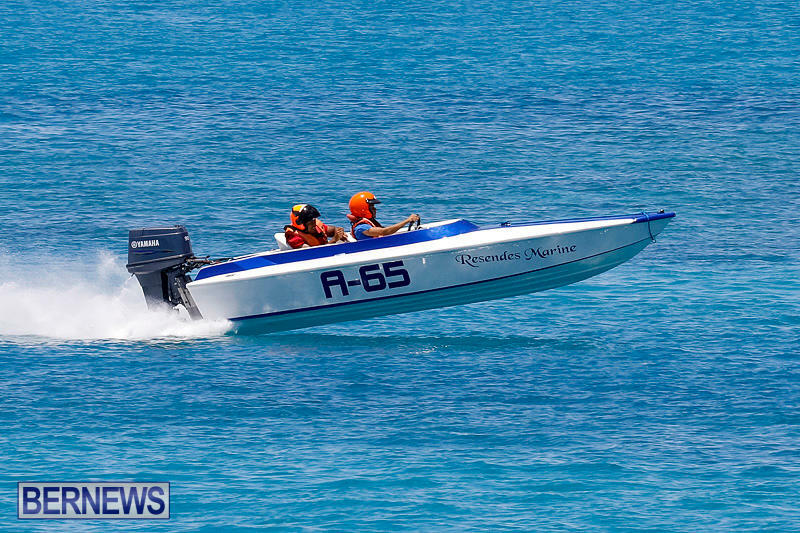 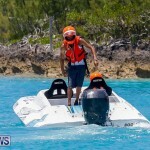 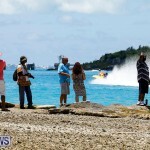 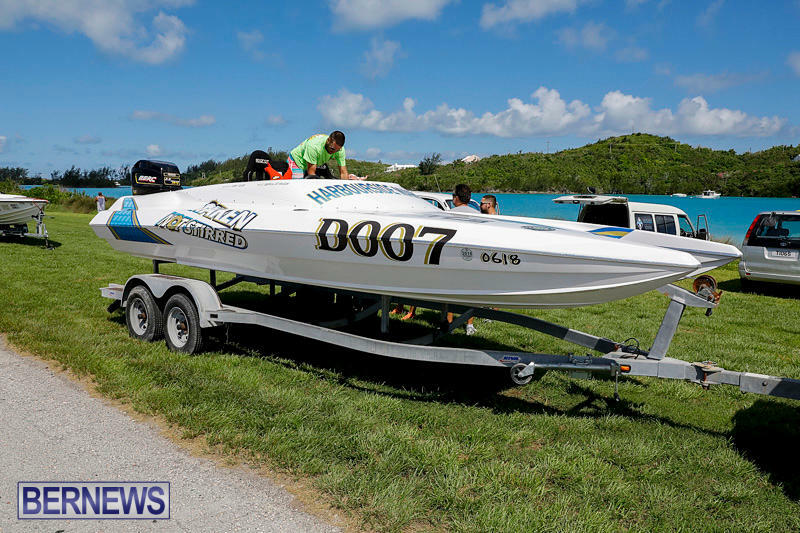 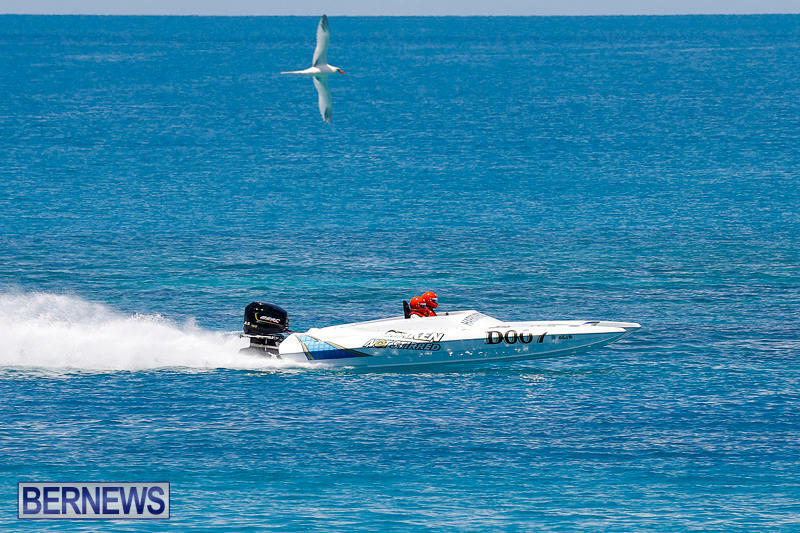 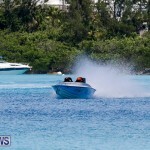 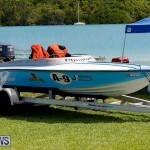 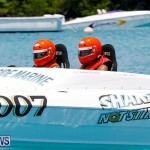 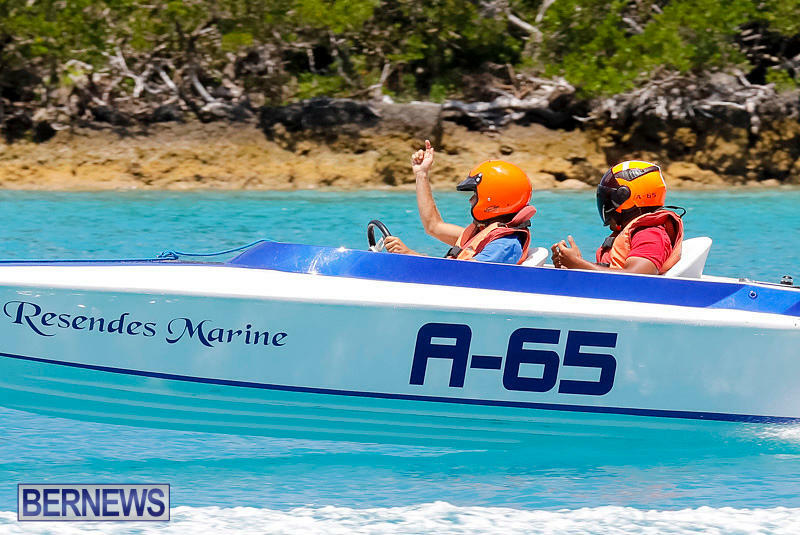 The 2017 powerboat racing season got underway this afternoon [July 9] at Ferry Reach as the Bermuda Power Boat Association hosted its first race day of the season. 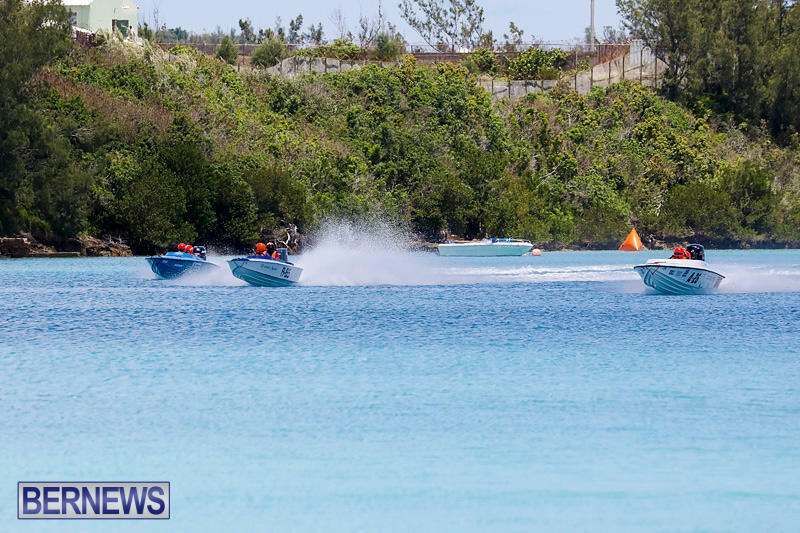 Two races were held today with an offshore and an inshore race run in front of the gathered crowds. 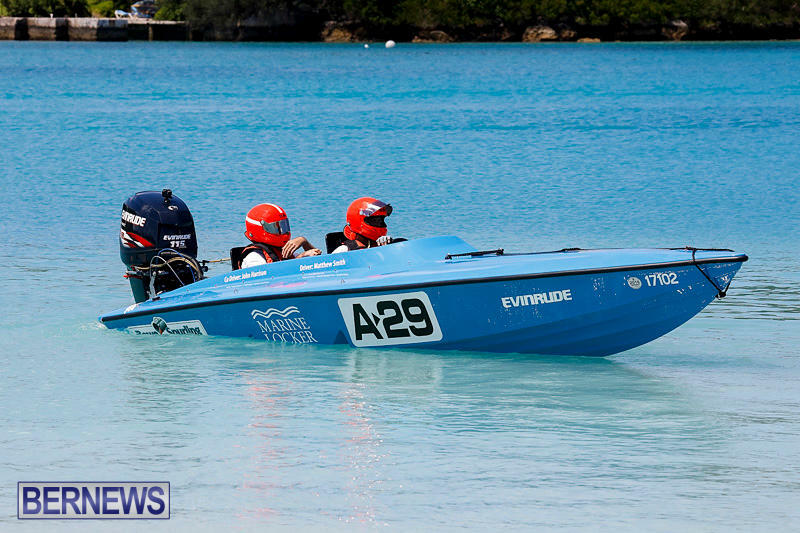 Shaki Easton and Errin Butterfield riding in A26 took first place in A Class for both races. 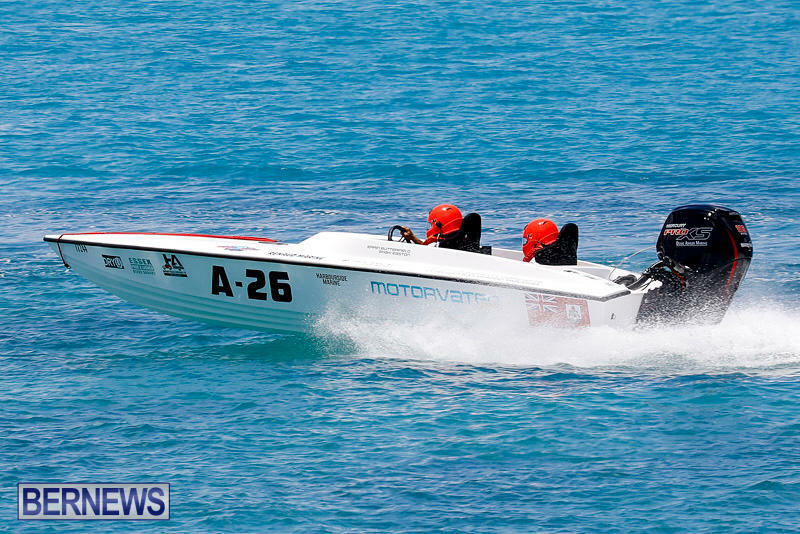 In C Class, Damon “Pirate” Simons and Aaron Cannonier riding in C941, and in D Class, Andrew Cottingham and Ex-Commodore Henry Talbot riding in D007, were the lone entries in their respective classes. 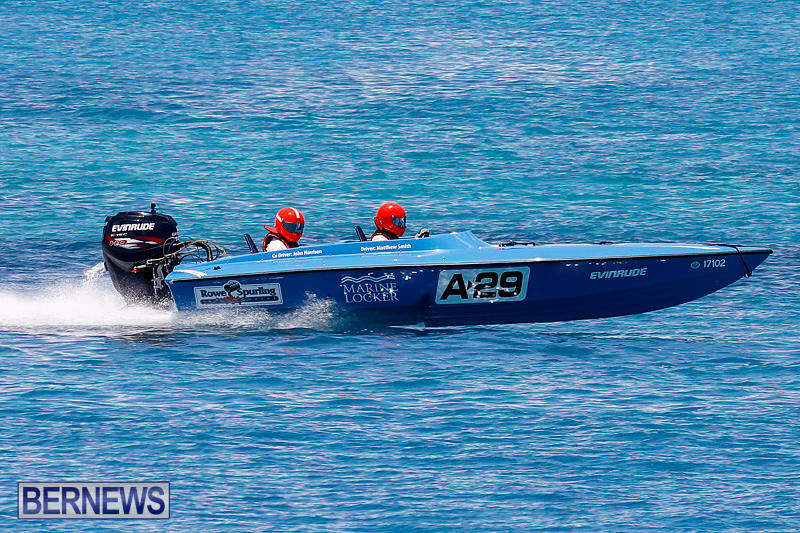 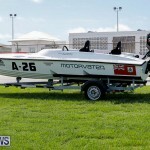 Damon “Pirate” Simons and Aaron Cannonier riding in C941 were unable to take part in the second race after an incident just inside the pylons in the first race saw the boat receive minor damages. 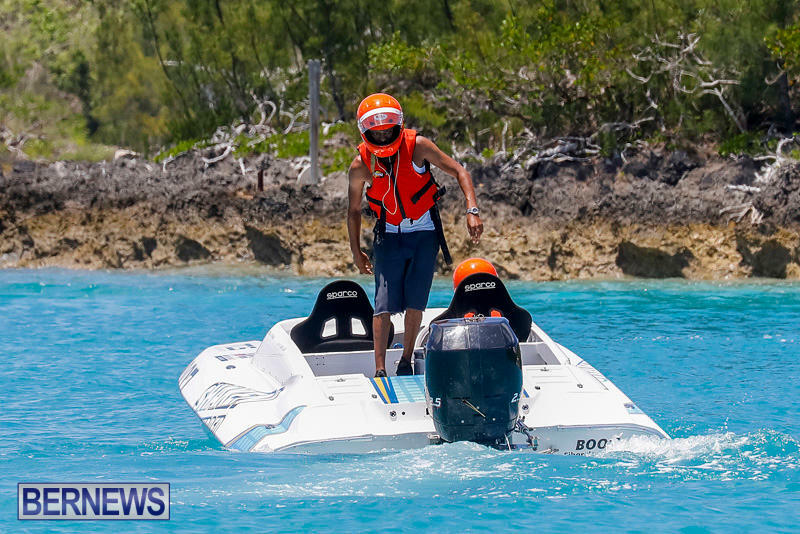 Both driver and co-pilot were said to be okay after being assessed by St John Ambulance personnel which included a KEMH EMT. 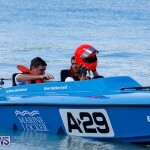 The next scheduled race day is on Sunday July 23rd with racing due to get underway at 1.00pm starting at Ferry Reach. 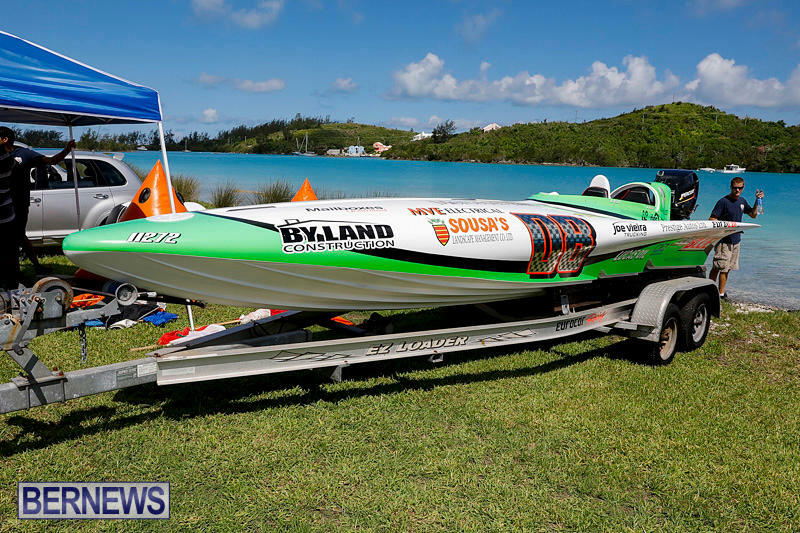 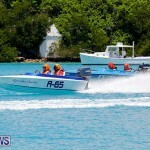 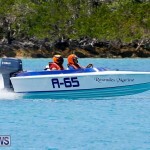 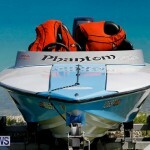 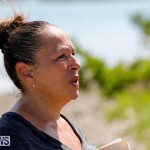 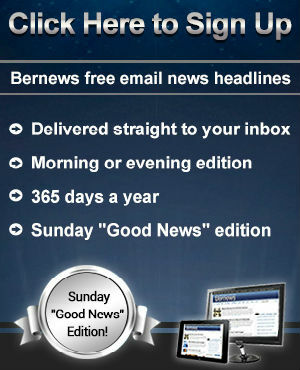 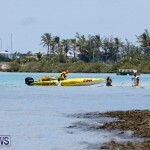 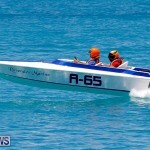 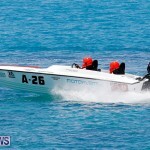 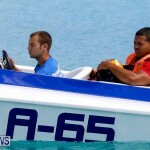 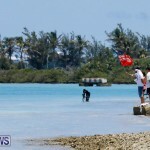 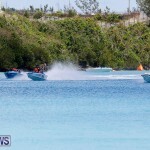 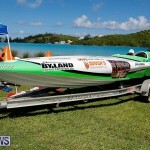 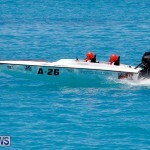 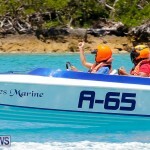 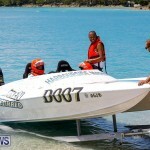 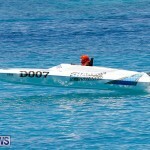 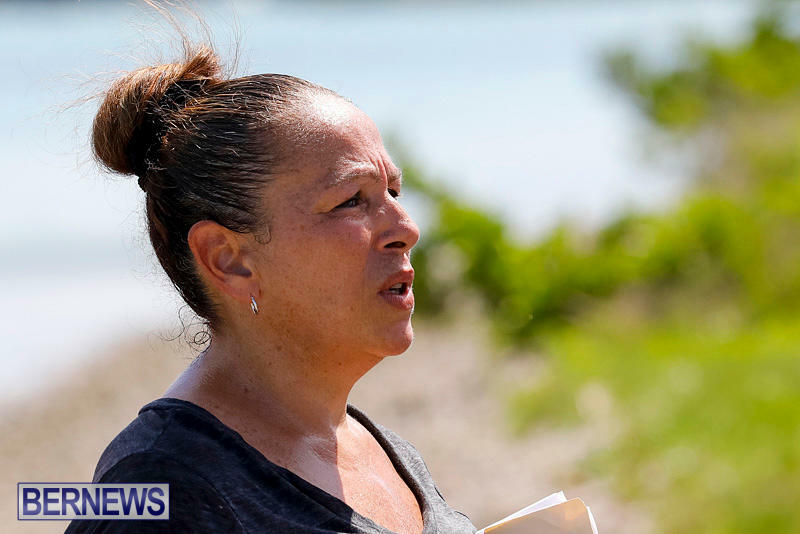 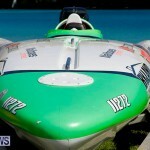 The annual Around The Island Boat Race is due to take place on Sunday, August 13th.